At the end of a group ride a few weeks ago, I was approached by a very strong Cat 5 racer who was having trouble placing in top positions. “What kind of sprinter are you?” I asked. I got a blank stare in return. The conversation almost ended there. In order to be successful, every racer needs to figure out the answer to that question. What kind of sprinter are you? We all dream of riding solo into the Roubaix velodrome, but in reality that is a rare event, and you’re going to have to sprint out of a group, whether the group is 2 racers or 102. Even Fabian Cancellara has done it. So it’s your turn to figure out what kind of sprinter you are. This should be an intuitive process coupled with some data to validate your assumptions. Ask yourself a few questions: Am I just getting wound up as I cross the finish line, or am I fading 20 meters before? Do I snap or pop out of the field in the first few pedal strokes, or am I like a diesel engine that grinds up to full throttle, and once there I’m good for the duration? Validate your assumptions with power data. Look at your fatigue profile and your mean maximal power for five, ten, and twenty seconds. It shouldn’t be too far off from what you probably already know about yourself. With this knowledge under your belt, what are you going to do? What will make a difference? Sprinting is all about tactics, planning, situational awareness, and practice. I tell all of my clients they need to think like sprinters. Watch the guys who are similar sprinters to you. Whose wheel do they follow? Where are they on the last eight laps, five laps, two laps? Is this the person’s wheel you want to be on for the last few laps of the race? You need to have a plan (several, in fact) for what you’re going to do. Know where the wind is coming from. In a long road race you should have at least walked or driven through the finish area. It’s best to ride the last few kilometers and discover what the obstacles are. Knowing this will be key for you as a sprinter. Is there a decisive hill or turn? For criteriums we can generally get on the course and cruise a few laps before going to the line. What are you thinking about when you warm up on the course? You’d better be thinking like a sprinter. Know what you need to do to be in a position to charge for the line in the last 200 meters. Knowing if you need to be in the top three positions with two or three turns is very different than a long 400-meter drag race to the line. I’ve heard many times that bike racing is like a high-speed game of chess. I equate it to another board game—backgammon. You’ve got to know what’s going on and have a plan. With every roll of the dice, the board changes, and so does your plan. This is precisely what happens moment to moment during a race. Things are constantly changing, and the changes can affect the final outcome of the race. The weather, a break with the two strongest guys in the field, a flat tire or a crash, and suddenly you’re at the back of a big group. 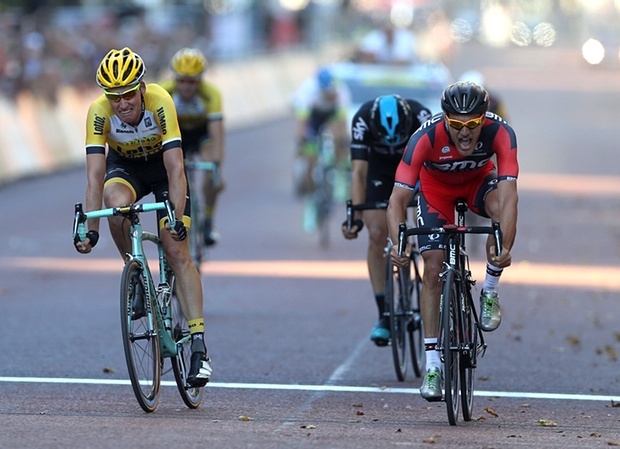 How you react, especially in the closing stages of the race, can have a bearing on the outcome. Now that you have an understanding of your strengths and weakness, it’s time to race your strengths and train your weaknesses. Where do you practice? Every time you’re on your bike—whether it’s the Saturday morning world championship ride, the Tuesday night training race, or the mailbox three miles from your house—is an opportunity to make yourself a better sprinter. What types of workouts do you need to do? Increasing your ability to spin high RPMs from a low speed will help your acceleration. Force yourself to extend the duration, and if you can hold this effort both in and out of the saddle, it will improve your sprint. Practice changing gears while sprinting. Find a training partner; there’s nothing like having someone pushing you to go just a bit harder. Ask your coach to add sprint-specific drills to your plan. Use your GoPro so you and your coach can see what you’re doing to improve your form. What does it take to be a sprinter? Tactics, planning, situational awareness, and practice. Incorporate these into your training plan and pre-race routine, then practice your salute to the crowd, because you now have the tools to win sprints.